Nazanin (Nikki) Houshyar joined the firm in 2015, as an associate attorney. She has extensive civil litigation practice, in the area of medical malpractice, and trial experience, in the areas of business litigation, employment law, and family law. Currently, her practice focuses on civil litigation and defending Southern California’s healthcare community. Ms. Houshyar graduated with B.A. degrees in Economics and Political Science from the University of California, Irvine in 2005, and earned her juris doctor from the University of La Verne College Law in 2009, where she was invited to join the NAPABA Moot Court. In 2010, Ms. Houshyar was admitted to practice in the State Bar of California and the United States District Court for the Central District of California. She attended Pepperdine University’s George L. Graziadio School of Business and Management also in 2010. Since starting her professional practice, Ms. Houshyar has also served as an associate attorney with the law firm of Carroll, Kelly, Trotter, Franzen, McKenna & Peabody, where her practice primarily focused on medical malpractice defense. 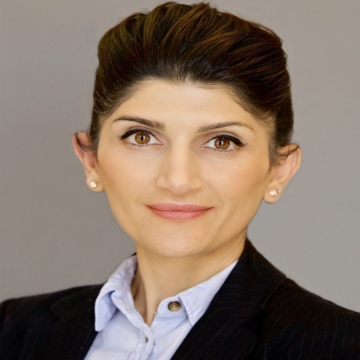 Ms. Houshyar is a member of the Orange County Bar Association and the Association of Southern California Defense Counsel.